The side-bet challenges made by Tiger Woods and Phil Mickelson added another dimension to The Match, but apparently they were only allowed to do so many. Golf Channel's Rex Hoggard, citing sources, said the PGA Tour limited the number of challenges between Mickelson and Woods. Tour policy prohibits players from gambling at the site of a Tour co-sponsored event, but a Tour spokesperson told Golf Channel that Woods and Mickelson did not violate any rules since the side bets went to charity. The broadcast relayed updated odds and moneylines after ever hole via the MGM Resorts Race & Sports Books, and the opportunity for side bets was heavily touted in the lead-up to The Match — by Mickelson, Woods, broadcasters and Bleacher Report — yet Woods and Mickelson made only five side bets that totaled $800,000 changing hands. 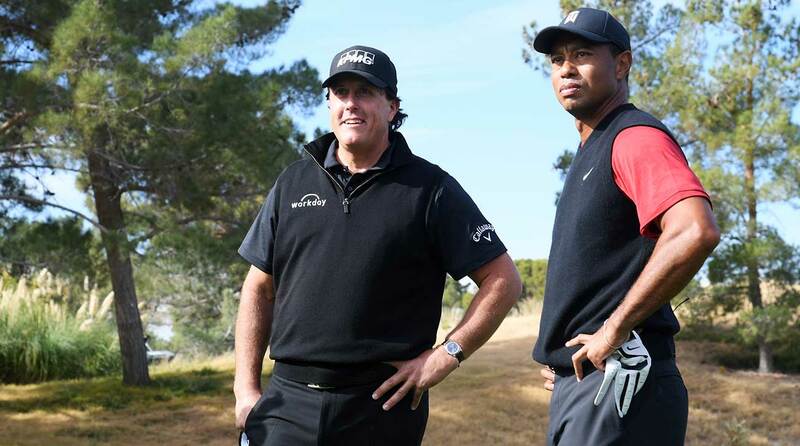 Phil Mickelson and Tiger Woods look on during The Match on Friday at Shadow Creek. One was on Mickelson making birdie on the 1st hole and three others were closest-to-the-pin challenges on par 3s. Another side bet was made for $1 million if either holed out for eagle on the par-4 9th hole, but neither did and the wager was pushed. "We're going to have multiple side challenges that are going to be in the six to seven figures that will be coming out of our own pockets," Mickelson said Tuesday, three days before The Match. "This event needs to be for a number that makes us nervous and makes us uncomfortable, and it definitely is. Because of that, I think both the nine million that we're playing for along with the hundreds of thousands and ultimately a million or two that we're playing for in side challenges throughout the match, I think it's enough for us both to feel uncomfortable and to feel the pressure." Sports gambling is destined to become an even bigger part of pro sports, and pro golf doesn't plan on being left behind. In fact, on Monday the Tour announced a deal with IMG Arena, a betting service and content hub that will distribute official Tour scoring data for media usage and betting purposes.